We see a lot of iPad and iPhone apps here. Some of them we try for a bit, check out what they have to offer and then discard. Other apps hang around a little longer; those are the ones we actually decide to review. Then there are the apps that really stick, the apps we use day in and day out, year after year. Those aren’t necessarily the apps that earn the highest rating, however. Sometimes it takes a while for an app to grow on you. So, we came up with the following list of 20 terrific apps (most of them optimized for the iPad, with one that’s definitely best on the iPhone alone). 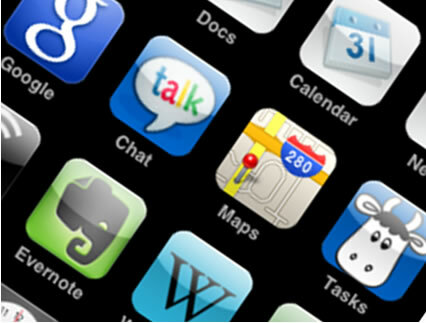 You’ve no doubt heard of all of these apps before. But do you have them installed? Are you using them? If not, we’ll tell you what we’d tell our family and friends: these are the apps we really use, the ones we think everyone should have. 1. Kindle : The iPad has changed the way we read. I spend as much (if not more) time reading news, lon-form journalism, and books on the tablet as i do on paper. But the free kindle iPad app has changed not only my reading habits but also my buying habits. The best part is the text is searchable, i can find the information i need quickly. Because it’s so portable, i can reach that information whenever and whever i want. That’s not to ay the app is perfect: The labels on its bookmarks are marvels of obscurityl i use notes instead. Search results are equally hard to parse. And sure i could use iBooks just as well but Apple can’t yet match Amazon’s selection. Yes i could export Amazon books to ePub format and then import them to iBooks. But Apple’s app isn’t any better than Amazon’s so why? I know plenty of people who have abandoned paper and do all of their book reading on kindle (in one form or another.) ‘m not there yet, but like any really good app, Kindle can do as much as you need it to. And for me, it does that very nicely. 2. IMDB : The internet movie database is older than the web itself. It began as the Usenet group rec.arts.movies, where zealous film buffs complied a searchable list of movie credits. From there it evolved into the massive website it is today, containing listing for more than 2 million movies and television shows and more than 4 million actors, directors, and crew members. After all those mutations, the database may have found its perfect form on the free IMDB iPad app. 3. Netflix : I purchased my first iPad for two reasons: to sketch on it, and to watch seasons of my favorite TV shows. It was made possible by the free Netflix app which allows you to view any item in the company’s Watch instantly catalog on your iPad (or, if you must your iPhone ). Although the app isn’t quite as full-featured as the Netflix website, it still offers more than enough to keep you satisfied. You can search the catalog by little or genre, rate films and TV shows you’ve seen, add a movie to your Queue, and of course watch TV series and movies until you eyes cross. App works on Wi-Fi or 3G so you can stream everything to almost anywhere; and if you want to watch Netflix on the big screen, you can use Airplay Mirroring. 4. Mint : My third-grade teacher ran a competetion to help us leatn about managing finances: We each received $100 in school buks, along with ouur every own checkbook, we could earn more by doing homework or partipating in activites. With those bucks we could buy things such as half-hour of reading time, an hour for art, or an extra bathroom break. But all that came at a price. We had to prove that our checkbooks were balanced before we could spend a dime. Today, the notion of balancing a checkbook seems as archaic as an hour of art class in public school. That dosen’t stop Mint.com from trying to help users make sense of their finances. The free online services offer a breakdown of my spending and saving across any account i’ve lined with it. I can see exactly how much i’ve been spending on a monthly basis, set and adjust budgets, and track my money habits, Mint intelligently categorizes most transactions though i can manually rename and categorize line items as well as enter cash transactions that may not be represented online. This free Mint.com app is the perfect companion to the site. Like so many other iOS essentials, it’s handy because it’s there when i need it most-such as when i’m about to purchase something and want to know whether i can afford that item. the app also makes managing finances a lot less painful; if you can do it from the comfort of your backyard hammock, you’re much likelier to do it in the first place. 5. Pandora Radio : Anyone who hasn’t been in a decade long sleep knows that Pandora is one of the most popular- and one of the best- music streaming services. Sign up for a free account, enter any artist, song, or composer, and Pandora creates a “station” of music that it believes complements your choice. It’s a brilliant idea, and the free Pandora iPad app is nearly as brilliant. On the app’s screen are all the basic Pandora controls i’m accustomed to namely Play, Skip, and Thumbs ip and Thumbs down. With my stations listed on the left side, it’s easy to select the station I want to listen to. I can just as quickly add new artists, songs, or composers to the list, merely by tapping in the appropriate field. But wait, there’s more: When i’m listening to a track, Pandora offers an extensive biography about the currently playing artist. Better yet, the app maintains a history of the tracks i’ve listed to – a most welcome connivence when i hear something i like but the next track starts playing before i can discover who the previous artist was. and much much more. 6. Instapaper : Save web pages for later offline reading, optimized for readability on your iPhone or iPod touch’s screen. Featured by Apple and critically acclaimed by top blogs, newspapers, and magazines! Great for long articles and blog posts that you find during the day and would like to read, but don’t have the time when you find them. Save with Instapaper, then read later when you’re commuting, in a meeting, or waiting in line. Need something to read? You can browse articles that your friends posted on Facebook, Twitter, or Tumblr. Or browse the Editor’s Picks, curated by hand from the Instapaper community’s most-saved stories. 7. Clear : Life is messy. Keep it together with Clear, an amazing new app for list-keeping that is unbelievably simple, quick and satisfying to use. Clear is designed with simplicity and flexibility in mind and works great with any list you throw at it!